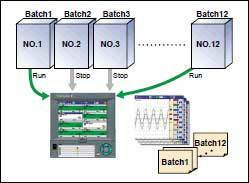 Using the Multibatch function, recorders installed at multiple facilities are centralized onto a single DXAdvanced, and independent data files can be saved for each facility. Record Start/Stop can also be controlled separately by batch. Greatly reduces equipment costs plus the time spent on acquiring and checking data. You can monitor recording status by batch in a single screen, the Batch Overview screen. 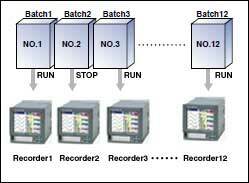 The maximum number of batches is 6 with the DX1000, or 12 with the DX2000 (with 200 MB internal memory).